Ken focuses on business transactions, particularly representing borrowers in secured and unsecured commercial lending transactions. 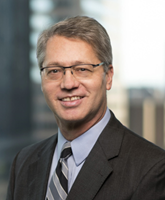 Ken has extensive experience with all aspects of secured financings, frequently serving as local counsel in multi-state transactions and providing legal opinions in connection with large commercial and project finance transactions. Representing commercial lenders for many years has given Ken a practical understanding of the goals and concerns that lenders and other parties bring to the negotiation table. This experience coupled with an understanding of the business and needs of each particular borrower helps him focus attention on productive areas of negotiation. Ken also represents borrowers and other parties in connection with loan workouts and other troubled-loan scenarios where knowledge of a borrower’s business and needs is critical. As part of his practice, Ken also advises companies on letters of credit, interest rate swaps, checks and other matters frequently encountered by companies in their dealings with financial institutions and their use of various payment systems and security devices. In addition to working on transactions, Ken advises companies on general contract matters, including laws and documents governing sales of goods and services and other contracts utilized by businesses in their day-to-day business activities. While Ken is well-versed in the nuances of the Uniform Commercial Code and other laws governing business transactions, the ability to think like a businessman rather than a legal scholar when reviewing documents and analyzing legal issues allows him to provide cost-effective advice that is suitable to a company’s needs in a particular context. The art of dealing effectively with many different personalities to achieve the best business result also led the firm to select Ken to serve as its Administrative Partner.